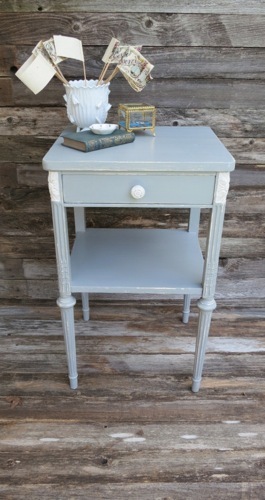 Beautiful vintage French Provincial side table or nightstand. Featuring a distressed hand painted gray and white layered finish with a gorgeous patina! Measures 28.5" tall, 16.5" deep and 22" wide, solid wood. 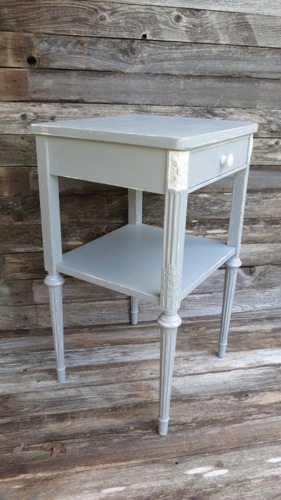 Gorgeous vintage tall French cottage style nightstand finished in grey paint with white detailing. 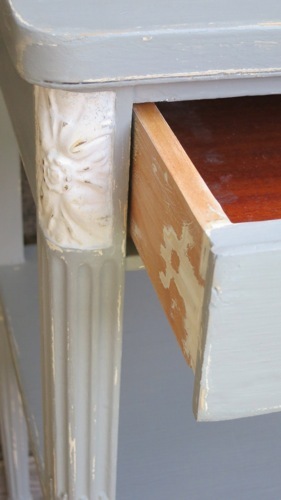 Hand painted, lightly distressed, and antiqued to bring out the lines and detailing, and finally waxed for durability. This is sturdy, and well made, the drawer is dovetailed with original hardware. No functional or aesthetic flaws to mention. Exquisite carved detail and beautiful lines throughout. Made by the WA Hathaway Fine Furniture Company in New York, which closed in 1924. It measures 18" across, 16" deep and is 30.5" tall.